Directed by the RSC’s deputy artistic director, Erica Whyman, this new, uplifting play, by Phil Porter, for families and audiences of all ages, has been specially commissioned for this season. 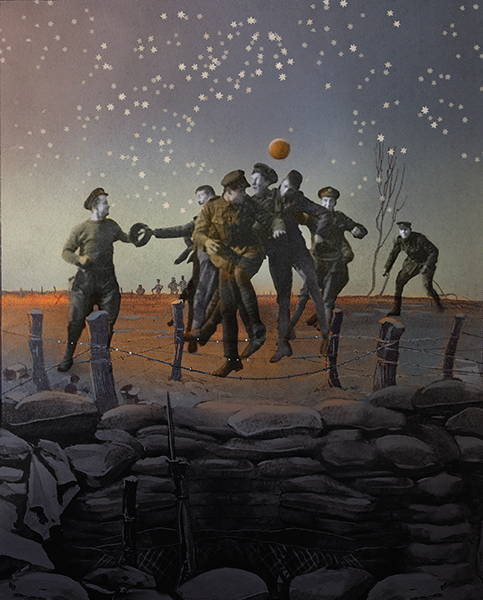 The story is inspired by real events exactly 100 years ago, when soldiers along the Western Front left their trenches on Christmas Eve, carrying only their courage and humanity, to meet their enemies in No Man’s Land to talk, exchange gifts and, incredibly, play football. The Christmas Truce will draw on true stories of soldiers in the Warwickshire Regiment and in particular, the experiences of local cartoonist, Bruce Bairnsfather, who worked at the original Shakespeare Memorial Theatre as an electrical engineer, and whose famous comic creation ‘Old Bill’ was hugely popular with the troops. As the RSC creates the production throughout this year, the company invites local people and those with connections to the Regiment to help uncover and commemorate stories from the period.